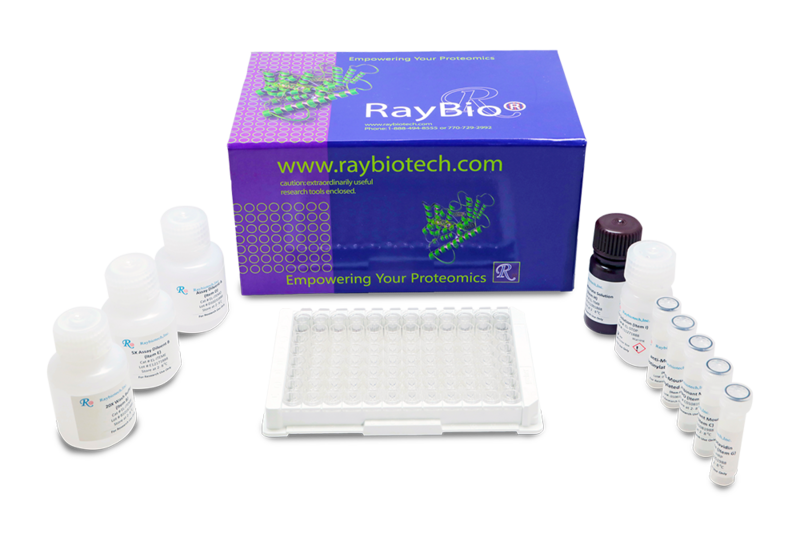 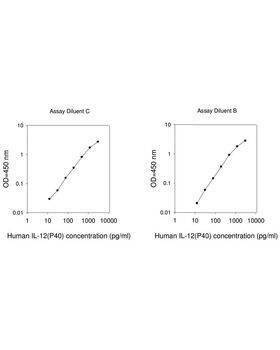 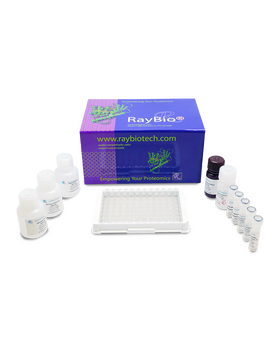 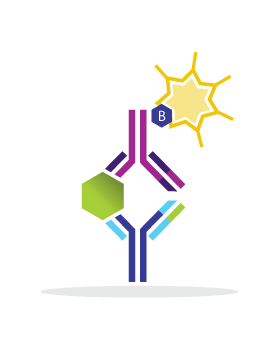 RayBio® Human IL-12 p40 ELISA Kit for cell culture supernatants, plasma, and serum samples. This ELISA kit shows no cross-reactivity with the following cytokines tested: human Angiogenin, BDNF, BLC, CNTF, ENA- 78, FGF-4, IL-1 alpha, IL-1 beta, IL-2, IL-3, IL-4, IL-5, IL-6, IL-7, IL-8, IL-9, IL-11, IL-13, IL-15, I-309, IP-10, FGF-4, FGF-6, FGF-7, G-CSF, GDNF, GM-CSF, IFN-gamma, IGFBP-2, IGFBP-3, IGFBP-4, Leptin (OB), MCP-1, MCP-2, MCP-3, MDC, MIF, MIG, MIP-1 alpha, MIP-1 beta, MIP-1 delta, PARC, PDGF, RANTES, SCF, SDF-1 alpha, TARC, TGF-beta, TIMP-1, TIMP-2, TNF-alpha, TNF-beta, TPO, VEGF. 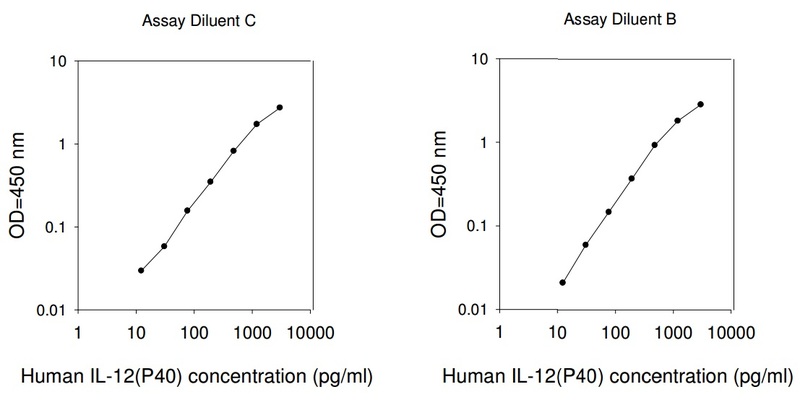 Abu Alshamat E., Al-Okla S., Soukkarieh C., kweider M. Human chorionic gonadotrophin (hCG) enhances immunity against L. tropica by stimulating human macrophage functions. 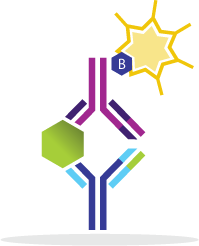 Parasite Immunol. 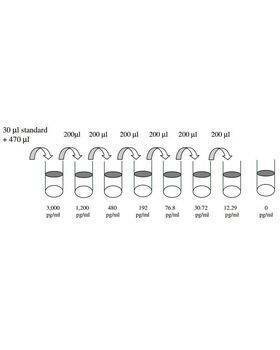 2012 Oct;34(10):449-54. doi: 10.1111/j.1365-3024.2012.01368.x.